Malaysia Airlines has renewed their Business Class sale ex Thailand to various destinations in Asia-Pacific that are great to collect Status Miles, especially if you credit to British Airways Executive Club. 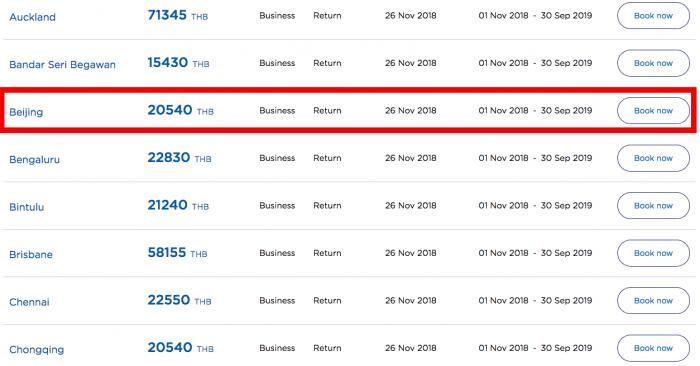 The last sale of the same nature ended roughly three months months with flights originating from Bangkok and Phuket offering decent fares within Asia so it’s good MH decided to bring it back. This time around the prices are once again quite low, although not as cheap as they’ve been through the last couple of sales. There are still some great deals to be had though. 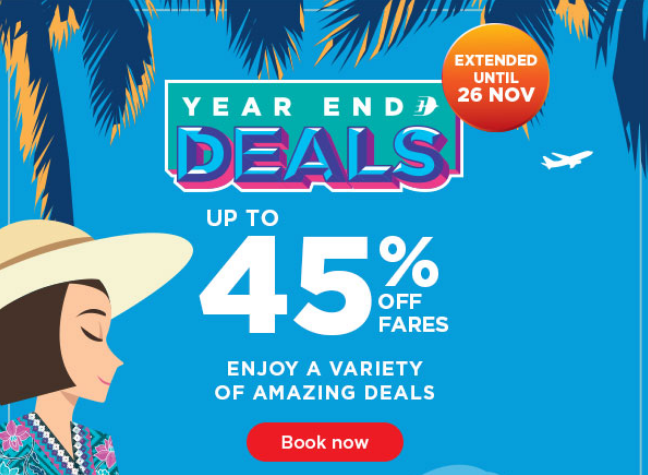 You can access this offer on the Malaysia Airlines website here. 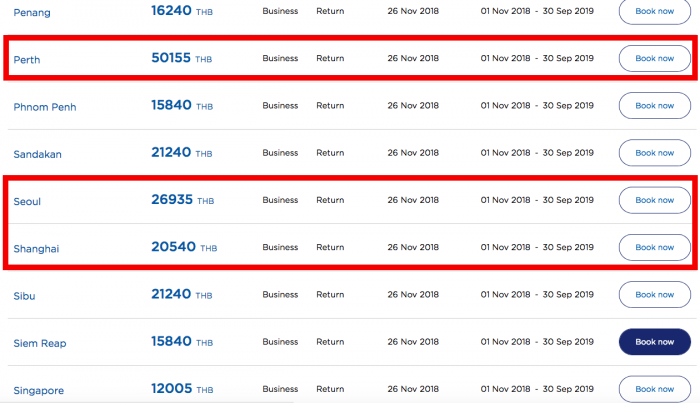 The booking window varies (ends November 26th 2018 with travel until 30th September 2019) so I felt it might be a good opportunity to once again bring this to the attention of our LoyaltyLobby readers in the region who might be able to utilize it. The travel time frame is very extensive this time around, previously it was always around six months. 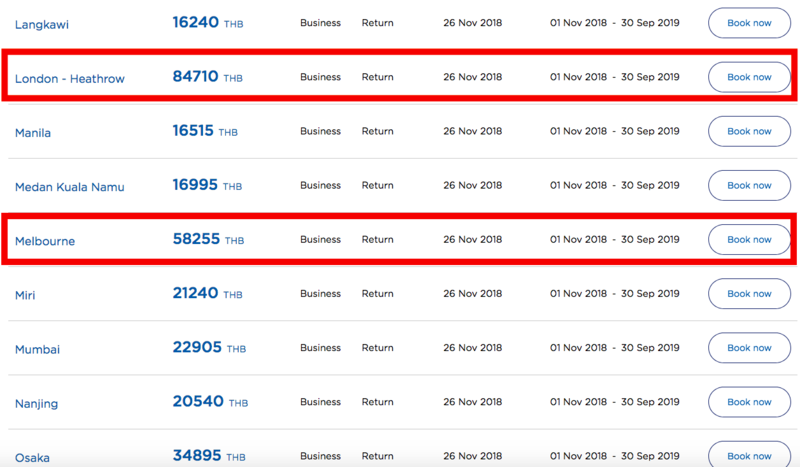 There are many destinations which I will list below, however for the purpose of maximizing your status credits with British Airways it is key to select flights that are over a certain threshold to jump from just 40 Tier Points for shorter flights such as the feeder BKK-KUL & up to 140 Tier Points for the connection depending on distance. The longer flights to Australia even earn 160 per flight. All in all the average and best priced tickets such as the ones to Beijing, Shanghai, Seoul or Taipei net you 360 Tier points start at 20,540 THB (~US$625) which is about $100 more than during previous sales. Seoul and Tokyo are more pricey as usual. The following are some offers ex Bangkok and I have verified that the advertised prices are indeed available. 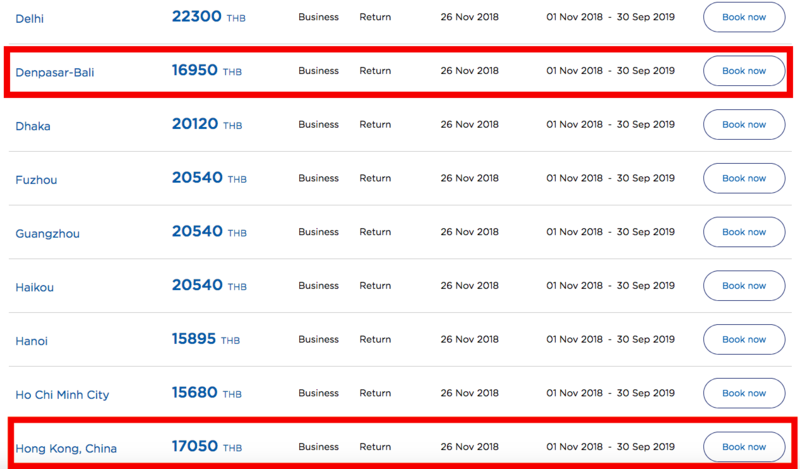 Even though it won’t collect many points (160 total), short haul destinations such as Bali, Langkawi and Singapore are available for as low as 12,000 THB per round trip providing nice leisure options. Once you consult the website you see plenty of additional destinations available so you might want to have a look there to see if there is something that suits your needs. Fares ex Phuket are available at about identical prices. These fares have many advantages since the destinations are actually very nice and useful for a holiday or business trip so it won’t be a total mileage run to unattractive places just for the sake of miles. You can incorporate many cities in one ticket through open jaw options and even go as far as include an overnight (transfer up to 24h) in Kuala Lumpur for the same price. Stopovers are available for US$50 extra which I used a few months ago in KL. The newly renovated First Class and Business Class Lounge at the Satellite Terminal is also finally open, making transit at KLIA a much more pleasant experience than during the construction. I find the First Class Lounge quite boring though and often just use the Business Class one where a buffet dining option is available which is much more efficient than the lackluster a la carte dining area. These fares have been coming and going for the last three years. You can collect plenty of Tier Points or qualifying miles with these fares and at a very low price. Problem with Malaysia Airlines is their chaotic schedule and “re-timing” of flights for operational reasons as well as aircraft changes. As far as the service on board is concerned I actually like Malaysia Airlines and always found the crew to be very pleasant. The food is decent with the signature Malay satay and on some routes including all the A330/A350 operated ones you can actually pre-order your meal and select out of an extensive list of very nice dishes through the ‘Chef On Call’ option (see here).